Sunday November 29th 1903 It was a cold windy day. I was busy all forenoon with the work and read all afternoon. Mollie and I talked all evening, she had a cold ride up. 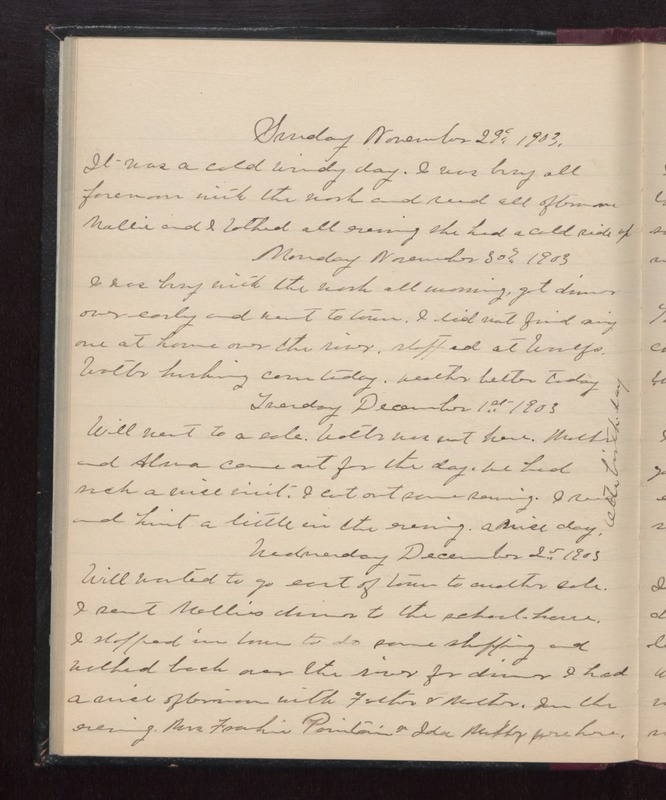 Monday November 30th 1903 I was busy with the work all morning, got dinner over early, and went to town. I did not find any one at home over the river, Stopped at Woolfs. Walter husking corn today. weather better today. Tuesday December 1st 1903 Will went to a sale. Walter was not here. Mother and Alma came out for the day. We had such a nice visit. I cut out some sewing, I read and knit a little in the evening. a nice day. Otts birthday. Wednesday December 2nd 1903 Will wanted to go east of town to another sale. I sent Mollies dinner to the school house. I stopped in town to do some shopping and walked back over the river for dinner. I had a nice afternoon with Father & Mother. In the evening Mrs Frankie Pointain & Ida Muller were here.